Imagine how hard it could be to add a touch screen to a Mac laptop. You’re thinking expensive and difficult, right? How could [Anish] and his friends possibly manage to upgrade their Mac with a touchscreen for only a dollar? That just doesn’t seem possible. The trick, of course, is software. By mounting a small mirror over the machine’s webcam, using stiff card, hot glue, and a door hinge. By looking at the screen and deciding whether the image of a finger is touching its on-screen reflection, a remarkably simple touch screen can be created, and the promise of it only costing a dollar becomes a reality. We have to salute them for coming up with such an elegant solution. They have a video which we’ve put below the break, showing a few simple applications for their interface. Certainly a lot less bother than a more traditional conversion. Laptop chargers face a hard life. They’re repeatedly plugged and unplugged, coiled up, stuffed into bags, thrown around, and just generally treated fairly poorly. Combine this with fairly lightweight design and it’s not uncommon for a laptop charger to fail after a few years. It’s usually the connector that goes first. Such was the case when I found myself face to face with a failed Macbook charger, and figured it’d be a simple fix. Alas, I was wrong. Unlike most PC manufacturers, who rely on the humble barrel jack and its readily available variants, Apple liked to use the Magsafe connector on its Macbook line. This connector has many benefits, such as quick release in the event someone trips over the cable, and the fact that it can be plugged in without regard to orientation. However, it’s not the easiest to fix. When the charger began failing, I noticed two symptoms. The first was that the charger would only function if the cable was held just so, in exactly the right orientation. The other, was that even when it would charge, the connector would become very hot. This led me to suspect an intermittent connection was the culprit, and it was quite a poor one at that; the high resistance leading to the heat issue. Our starting point – a badly worn and frayed Macbook charger. I found it interesting to see that the shield was in two layers, wound in alternate directions. Sidecutters weren’t the best tool for the job, but they’re what I had lying around. The soft metal is fairly easy to cut with hand tools. It’s at this point with any other charger that you get out your trusty sidecutters, lop the end off, and tap away at Digikey to get a replacement part on the way. With Magsafe? No dice. Replacement parts simply aren’t available — a common problem with proprietary connectors. I endeavoured to fix the problem anyway. I began to strip away the metal shell around the back of the connector with my sidecutters, and eventually an angle grinder. A Dremel would have been the perfect tool for the job, actually, but I persevered regardless. After much consternation, I had the connector peeled back and was able to identify the problem. Sick of his 2011 Macbook kicking its fans into overdrive every time the temperatures started to climb, [Arthur] decided to go with the nuclear option and cut some ventilation holes into the bottom of the machine’s aluminum case. But it just so happens that he had the patience and proper tools for the job, and the final result looks good enough that you might wonder why Apple didn’t do this to begin with. After disassembling the machine, [Arthur] used double-sided tape and a block of scrap wood to secure the Macbook’s case to the CNC, and cut out some very slick looking vents over where the internal CPU cooler sits. With the addition of some fine mesh he found on McMaster-Carr, foreign objects (and fingers) are prevented from getting into the Mac and messing up all that Cupertino engineering. [Arthur] tells us that the internal temperature of his Macbook would hit as high as 102 °C (~215 °F) under load before his modification, which certainly doesn’t sound like something we’d want sitting in our laps. With the addition of his vents however, he’s now seeing an idle temperature of 45 °C to 60 °C, and a max of 82 °C. In the end, [Arthur] is happy with the results of his modification, but he’d change a few things if he was to do it again. He’s somewhat concerned about the fact that the mesh he used for the grill isn’t non-conductive (he’s using shims of card stock internally to make sure it doesn’t touch anything inside), and he’d prefer the peace of mind of having used epoxy to secure it all together rather than super-glue. That said, it works and hasn’t fallen apart yet; basically the hallmarks of a successful hack. It’s worth noting that [Arthur] is not the first person to struggle with the Macbook’s propensity for cooking itself alive. 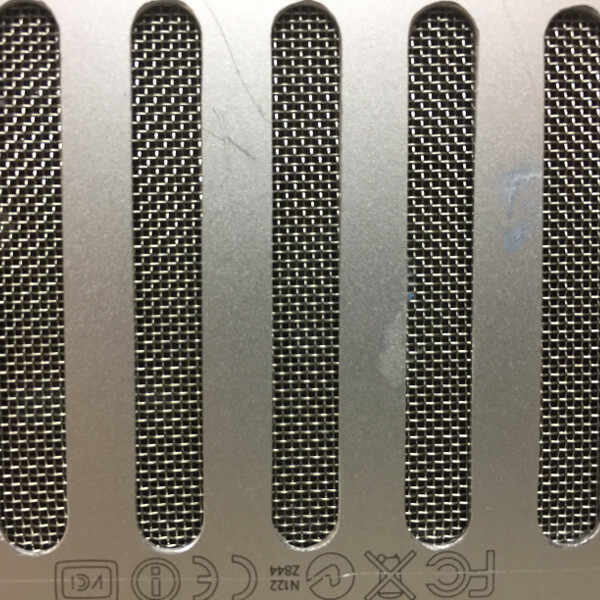 A few years back we covered another user who added vents to their Macbook, but not before they were forced to reflow the whole board because some of the solder joints gave up in the heat. Anyone who regularly presents to an audience these days has known the pain of getting one’s laptop to work reliably with projection hardware. It’s all the more fraught with pain when you’re hopping around from venue to venue, trying desperately to get everything functioning on a tight schedule. [Seb] found that the magic keystrokes they used to deal with these issues no longer worked on the Macbook Pro Touchbar, and so a workaround was constructed in hardware. The build itself is simple – an Adafruit Trinket serves as the brains, with a meaty 12mm tactile button used for input. The Trinket emulates a USB keyboard and sends the Cmd-F1 keypress to the computer when the button is pressed. The button’s even mounted in a tidy deadbugged fashion. While it’s not at all complicated from a build standpoint, the key to this project is that it’s a great example of using the tools available to solve real-life problems. When you’re in a rush with 300 people waiting for your talk to start, the last thing you need to be worrying about is a configuration issue. [Seb] now has a big red button to mash to get out of trouble and get on with the job at hand. It does recall this much earlier hack for emulating a USB keyboard with an Arduino Uno or Mega. It’s a useful skill to have! [Klakinoumi] wanted to use their Magsafe 1 charger from 2007 with their newer Macbook Pro Retina from 2012 — but it had a Magsafe 2 port. There were a few options on the table (buy an adapter, buy a new charger, cry) but those wouldn’t do. [Klakinoumi] went with the brute force option of grinding a Magsafe 1 charger to fit Magsafe 2. Based on the existence of passive adapters that allow Magsafe 1 chargers to work with newer laptops, we’d assume that the older chargers are probably electrically similar to the newer models. That said, it’s not our gear and we’d definitely be checking first. With that out of the way, it’s a simple enough modification — grind away the Magsafe 1’s magnet until it fits into a Magsafe 2 port. It really is that easy. The spring-loaded pins all seem to line up with the newer port’s pads. [Klakinoumi] reports it worked successfully in their tests with 2012, 2014 and 2015 Macbooks but that it should be attempted at your own risk — good advice, as laptops ain’t cheap. When doing this mod, consider taking care not to overheat the connector during grinding. You could both melt plastic parts of the connector, or ruin the magnet by heating it past its Curie point. Interested in the protocol Magsafe speaks over those little golden pins? Find out here. Eight or nine years ago, Apple was on top of the world. The iPhone just revolutionized phones, Apple was still making computers, and these computers were actually repairable. Of the late 2008/early 2009 MacBook Pro, iFixit said, “What an incredible machine. We are very impressed by the ease with which the new MacBook Pro came apart. This machine should be a joy to work on”. Apple has come a long way since then. [DocDawning] has a bit of a Mac hoarding problem, and frequently pays $20 for broken laptops of this vintage. Most of the time, the fix is simple: the RAM needs to be reseated, or something like that. Rarely, he comes across a machine that isn’t fixed so easily. The solution, in this case, is a deep dive into heat guns and thermal management. How do you bring a laptop back from the dead? [Dawning] shows you how. Like the old XBox towel hack, the first thing to look for in dead electronics is broken solder balls. Of course, actually looking at broken solder balls is pretty hard, so you might as well just get out a heat gun and go at it. That’s exactly what [Dawning] did. With the clever application of an aluminum takeout tray to direct the heat flow, he blasted each of these chips with enough heat to hopefully melt all the balls. With that, a working MacBook Pro was just a liberal application of thermal paste away. From $20 at the scrap heap to a working computer, [Dawning] did it. He successfully resuscitated a broken computer. For the last decade, Macs have been running a UNIX-ish operating system on x86 processors. They’ve been fantastic developer’s machines, and the MacBook Pro is the de facto standard laptop issued to all developers, all hackathon attendees, and arguably, anyone who does real work with a computer. This week, Apple unveiled the latest MacBook Pro and provided more evidence Steve Jobs actually knew what he was doing. Fifteen hundred bones will get you a MacBook Pro with a last-gen processor, an Escape key, a headphone jack, and two Thunderbolt 3 ports (with one port required for charging). The next model up costs $1800, ditches the Escape key for a dedicated emoji bar, and includes four Thunderbolt 3 ports. In the past, I have defended people who choose MacBooks as their laptop of choice. A MacBook is a business-class laptop, and of course carries a higher price tag. However, Apple’s latest hardware release was underwhelming and overpriced. If you’re looking for a new laptop, you would do well to consider other brands. To that end, here’s a buyer’s guide to ThinkPads, currently the second most popular laptop I’ve seen with the dev/hacker/code cracker crowd. Gregg Eshelman on Need A Small Keyboard? Build Your Own! TM on Need A Small Keyboard? Build Your Own! castvee8 has added details to Vacuum tube single digit calculator. Alastair Hewitt has updated components for the project titled YATAC78 - The WWW TTL Computer. Adam Jensen has updated the log for (Exosuit? )/VR Controlled Bot. Tinkers Projects has updated the project titled ESP12 Bar-code Scanner. castvee8 has added a new project titled Vacuum tube single digit calculator. Grateful Dave liked Smart Mirror. Piotr has updated the log for MicroPython powered PLC. Grateful Dave liked pcbtc (GaN edition).